Cuddly Shark return to the stage in a few days having just finished tracking their forthcoming sophomore album which is currently being mixed at Mr. Bendy’s Music Emporium. The show is being put on by Scottish blogger, The Daily Dose, with proceeds going towards the charity Action For Children. The line-up also includes Carnivores, The Darien Venture, and No Island. 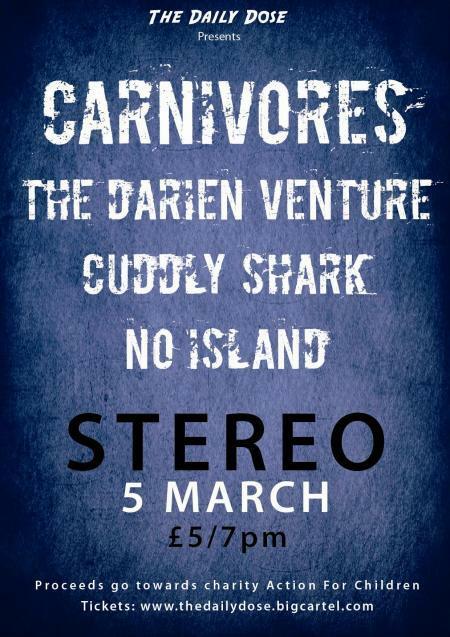 So make sure you get on down to Stereo, Glasgow on Monday 5th March. Tickets can be bought here or on the door on the night. As is the norm these days there’s also a Facebook event page, why not confirm your attendance in writing!